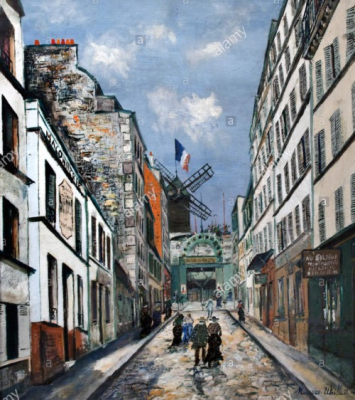 Much of the old Montmartre is still identifiable such as the windmill on the left in the picture above (now a restaurant), as are some of those where the artists lived and worked although Picasso's old atelier the Bateau-Lavoire is a little run-down. The ancient inn called the Lapin Agile is as atmospheric as it ever was although a little more up-market than when the artists spent rowdy evenings there. But often in the euphoria of being in places such as Montmartre it's easy to miss places of most interest and when you are out in the sunshine enjoying the atmosphere a museum is the last place you want to go especially if the day before was spent tramping around the Louvre. However, the museum of Montmartre at No 12 rue Cortot is well worth a visit if only as an introduction to Suzanne Valadon who lived and worked here for a while. 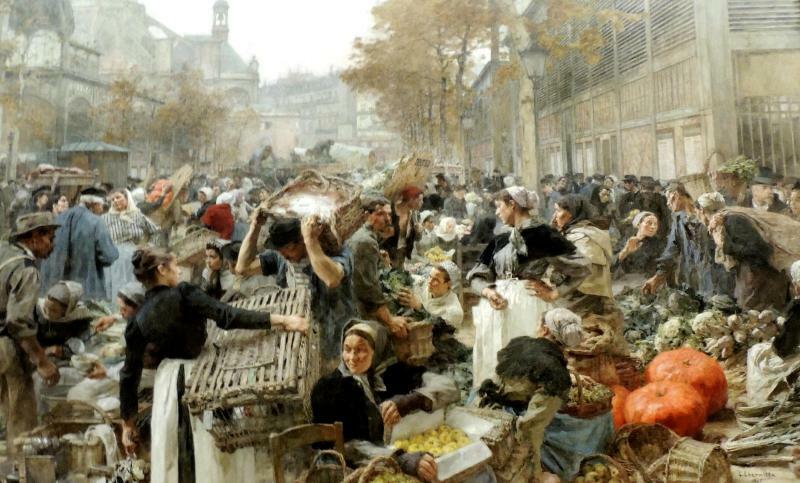 Suzanne and her son Maurice both lived and worked in Montmartre and although they are possibly lesser known than their contemporaries are well worth knowing for their work and their fascinating lifestyles. 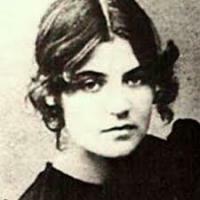 Suzanne Valadon (1865 - 1938) was born in Haute-Vienne and christened Marie-Clémentine Valadon - the daughter of an unmarried laundress, she could well have been the role-model for Cosette in Les Misérables; but unlike Fantine, Marie-Clémentine's mother kept and looked after her daughter. That's not to say that life wasn't difficult and as a child she began work aged 11 in a series of menial jobs for the next 4 years until, in an early display of her tempestuous nature, aged just 15, she joined a circus as a trapeze artist. Marie-Clémentine's career in the circus was brought to an abrupt end when she fell from the trapeze and one year later aged 16 she began work as an artist's model. In the years that followed she modelled for most of the artists in Paris and she has been immortalized in paintings by Toulouse Lautrec, Renoir, Degas, Berthe Morisot, Picasso, Puvis de Chavannes and many others. 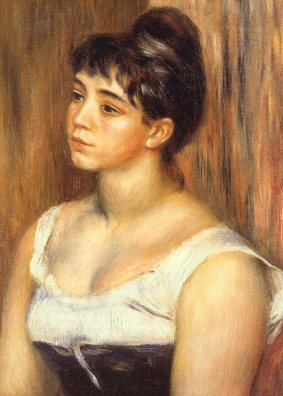 The young model's voluptuous good-looks made her a favourite among the artists, not least Edgar Degas who became her mentor and Toulouse Lautrec who renamed her Suzanne, a name which stuck and was used universally thereafter. Suzanne was always wild in her youth and she had many affairs with the artists who painted her in a way of life which would have been recognizable during the sexual revolution of the 1960's and inevitably she became pregnant aged just eighteen giving birth to her son Maurice on the 26th December, 1883. In the Paris of the late 19th century Suzanne's way of life did nothing to detract from her reputation and she carried on working as before with her louche lifestyle in some strange way complementing her modelling career. 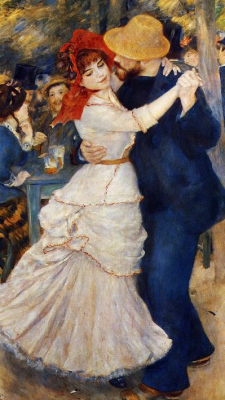 The Dance at Bougival by Pierre-Auguste Renoir is just one of many images painted of Suzanne Valadon. After modelling for over a decade, Suzanne abandoned her life as a model and began to paint for herself producing canvasses of female nudes, portraits, still lifes and landscapes. Two years after beginning her new career, Suzanne became the first woman to be admitted into the Societé Nationale des Beaux-Arts and was acknowledged as a peer of the artists she had modelled for. Suzanne's Bohemian lifestyle led her into an affair with the composer Erik Satie, living together on the rue Cortot until she tired of him and went on to marry Paul Moussis in 1895. As time went by Suzanne added to her legendary free-wheeling ways with various eccentricities such as feeding her cat caviar, wearing corsages of vegetables and keeping a goat in her studio, and as unrestrained as ever in 1908 she began an affair with her son's friend, the artist André Utter - she was aged 44 and he was 23. In 1913, Suzanne divorced her husband and married Utter soon afterwards entering into a partnership which lasted until 1934 when they too divorced when Suzanne was aged 69 and Utter was 48. Suzanne Valadon died in 1938 aged 72 and was buried in the Cimetière Parisien de Saint-Ouen to the north of Paris. It is a measure of Suzanne Valadon's worth that there is an asteroid named after her and a crater on Venus and at the bottom of the Montmartre funicular passengers step into La Place Suzanne Valadon. Suzanne Valadon portrait (top) and by Renoir (left). Many years ago quite by chance I chatted with an old Parisian lady at a pavement café close by the Madeleine. When the conversation turned to Maurice Utrillo she told me that she had been at school with Utrillo and when the she went to lunch with Utrillo and their school friends he would spend his time drawing on the tablecloths - she said wistfully that she wished "she had some of them now as they would be worth a fortune." The manner in which Suzanne Valadon's son came to be known as Maurice Utrillo has entered into legend in the Valadon iconography - Suzanne would never divulge the name of the father of her child, possibly because she didn't know it, but tiring of the constant speculation she took up the offer of a friend named Miguel Utrillo to put his name on the birth certificate and her son was forever after known as Maurice Utrillo. Despite the fact that he looked more like a headmaster than a Bohemian artist, Utrillo showed signs of the alcoholism that would plague him all his life, from an early age. When Utrillo was a baby, Suzanne left him in the care of her mother and it has been suggested that her habit of feeding the baby wine to soothe him was the cause of his problems. 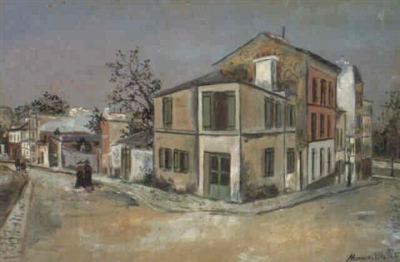 By the time he reached 21, Utrillo was showing signs of the mental illness which would in future years consign him to mental institutions at regular intervals. 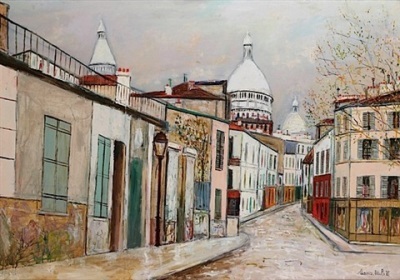 It was Utrillo's mother, Suzanne, who started him on his path as an artist when following an episode of illness she suggested that he take up painting as a diversion from his troubles. From 1904 onwards Utrillo painted mostly scenes of Montmartre, selling many of his pictures to local innkeepers for a pittance in order to fund his drinking. 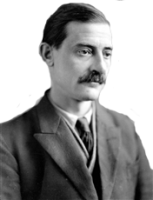 But his talent was outstanding attracting attention internationally as well as at home so much so that in 1928 he was awarded the Légion d'honneur. 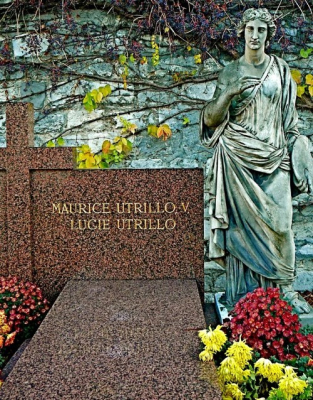 In 1935, aged 53, Utrillo married Lucie Valore and moved to Le Vesinet, 12 miles to the west of Paris where his illnesses caught up with him and he could only work from memory or from his window. If painting was a therapy for Utrillo's mental fragility then he used it to the full producing throughout his lifetime a staggering number of paintings, mostly of Montmartre but sometimes of further afield when his health allowed. Utrillo's legacy, however, is the host of colourful paintings he has left us of Montmartre when it was still a picturesque village at the beginning of the 20th century. Of all the crowds milling around Place du Tertre and the sidestreets of Montmartre, very few consider walking down the streets on the northside of the Butte - possibly because its quite steep or more likely it appears that Montmartre begins and ends on the heights. 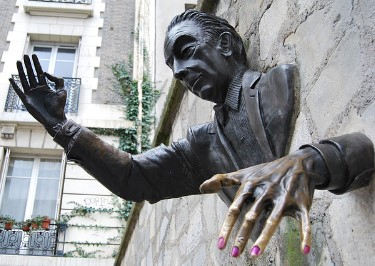 However, a walk down rue des Saules will soon bring you to the chocolate-box pretty La Maison Rose but if you turn left at rue Norvins then you will arrive at Le Passe-Muraille which is a startling evocation of Marcel Aymé's 1943 novel The Man Who Walks Though Walls. You will by now have worked out that unless you like long walks then this area of Montmartre is a matter of choices. And from Le Passe-Muraille there is the choice of walking down the twisting, long road which is rue Lepic which will bring you down to Pigalle passing the house where Van Gogh's estimable brother took him in when things became too much for the tortured artist. But then again, if you choose the rue Girardon the you will walk down streets every bit as twisty and picturesque as those on the Butte and arrive at Place Dalida. This area was the home of the singer Dalida who was known for her beauty and her hit recordings when she was at her peak during the 1950's - there's a bronze bust in her honour there, the bosom of which attracts a great deal of attention and has become quite shiny. If you are still with me by this time then you won't feel like facing the climb back to the Butte but if you continue along rue Giradon and turn into rue Lucien Gaulard you will arrive at the Cimetiére St-Vincent and there in a corner easily found is the grave of Maurice Utrillo, the Artist of Montmartre and his wife Lucie. 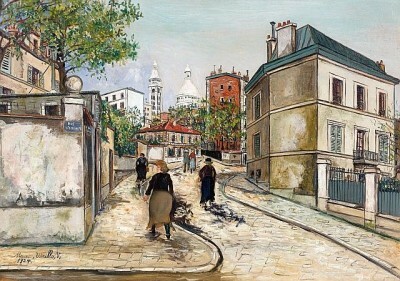 Utrillo painted all the streets which led down to St Vincent Cemetery and here they are as they were in the 1920's. However, you could have reached it far easier and far quicker but it would not have so interesting. rue Lepic on the right is very long and very steep. The walkers in this Utrillo painting are walking up the Bal de la Galette, now a restaurant where the last windmill on Montmartre still stands(just). If you refer to the black and white picture, top right, it is the hill where the communards stopped the National Guard and took their cannon. The same windmill is in the background. rue des Saules, La Maison Rose and rue d'LAbreuvoir where Utrillo's favourite bar stood. Aptly, un abruevoir is French for a watering-hole. The tragedy of Napoleon III (1808 - 1873) was the inherent force which compelled him to try to emulate his uncle Napoleon I's exploits on the battlefield. The Emperor, Napoleon III, could never be satisfied until he had garnered even a small portion of La Gloire which enveloped Bonaparte, and it led him to the disaster at Sedan in 1870 during the Franco/Prussian War, which brought his empire crashing down. The subsequent humiliation of the siege of Paris by the Prussian armies and the insidious depradations of the Commune were so overwhelming that the true legacy of Napoleon III has been overlooked. Napoleon III's real talent was in the nature of public works on a grand scale and it was his drive and energy which brought about the building of the Paris that we see today; the razing of the decaying old dwellings of Paris which so many Parisians deplored was in reality a gigantic slum-clearance; the Grand Boulevards turned the business of creating throughfares into an art-form, despite the conspiracy theorists who claimed it made life easier for cavalry to charge insurgents; and there were the numerous parks, inspired by his exile in England, which are still jewels scattered around Paris. Just as Napoleon III had inspired Baron Haussman in his great building works, in regard to his park building projects, Jean-Charles Alphand filled the same role, in company with the designer Gabriel Davioud who had designed the impressive fountain on the boulevard St Michel. When the Emperor, advised by Haussman, chose to build on a piece of land on the outskirts of the city in the 19th arrondissement, both Alphand and Davioud must have been taken aback by the task facing them - once the site of the Montfaucon gallows, the land which for miles around had been a series of quarries, a sewerage dump and a waste ground, was a daunting prospect for any prospective landscaping project. Work began in 1864, shaping the land into the required contours with only the traditional gardening tools and a great deal of manpower to carry out the work with the only help available from the Industrial Revolutionary process, a train carrying fresh soil to the site. The TV program Friends - every episode has a poster of Buttes Chaumont on the wall in the background. There is undoubtedly an English influence in some features of the park but the centrepiece is a stunning and inspirational design by Davioud which stands apart from traditional park motifs and is in a class of its own - there's no doubt that if the 50 metre high cliff, crowned by its Temple de la Sibylle and surrounded by an artificial lake was in central Paris, it would be known around the world. Intriguingly, the only way to reach Davioud's magnificent folly is by two bridges - one on the north side, a 65 metre long suspension bridge built by Gustave Eiffel whose famous tower was 20 years in the future, and a smaller one on the south side distinguished by its fencing of faux wooden logs which are actually cement and stone. Unfortunately, a spate of suicides has given the bridge the nickname of "suicide bridge" which has necessitated a chain-link fence being erected. For those people who do manage to make their way to the craggy peak without feeling the compulsion to leap into the void the island is a delighful series of twisty soil paths, with a paved path and a smaller bridge with the same concrete logs leading to the belvedere at the summit. On the south side of the park Davioud has borrowed from an English fashion for grottoes which were in vogue at the time. 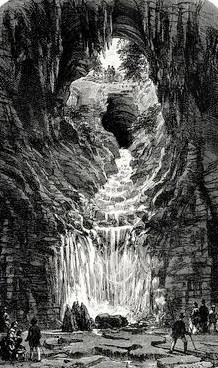 Davioud expanded on the theme by making his grotto large enough to enter so that visitors could see the series of waterfalls which ran into and out of the grotto. Given the absence of modern machinery it was an impressive feat to have turned a wasteland into a fairyland in a mere three years and it was surely not just coincidence that the park opened at the same time as the Universal Exhibition of 1867. The Universal Exposition was held on the Champ de Mars where the Eiffel Tower now stands and was built in response to England's Great Exhibition. 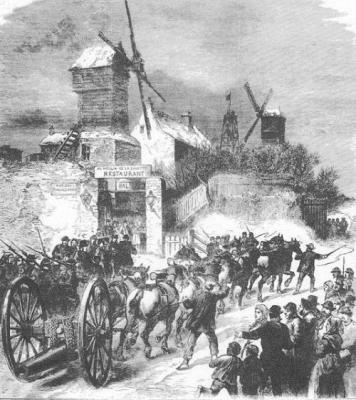 It is quite ironic that one of the most impressive sights on display was a gigantic 50 ton German Krupp cannon which fired 1,000 lb shells; the same cannon would in three years time fire those shells during the Franco/Prussian War and play a part in the humiliating downfall of Napoleon III. 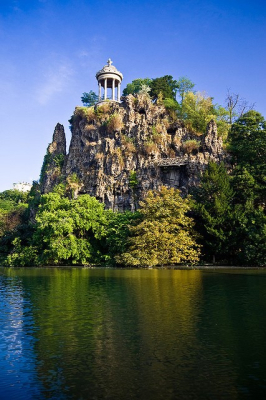 It was also ironic that following the defeat of the Paris Commune in June, 1871,, when bands of Communards were hunted down throughout the city, the island of Les Buttes Chaumont was one of the places where they made their last stand. For some reason the Church of Saint Augustine at the bottom of rue Malesherbes is rarely visited by tourists, yet from a historical and aesthetic perspective stands comparison with most buildings in the city. Standing at the corner of a confluence of Grand Boulevards the church was built in 1860 to 1870 in order to serve the newly populated area in the 8th arrondisement. 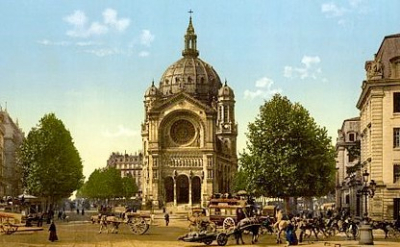 For anyone looking to find the perfect example of what Baron Haussman created, the church and its surrounds are a perfect example, comprising large buildings for a wealthy bourgeoisie, wide boulevards for their carriages and a church standing at the heart of the community. Perhaps because it embodied everything the 2nd Empire stood for, Napoleon III and the Empress Eugènie had a special fondness for the church and its surrounds and actually planned to be buried there; the iconic "best laid plans" of Robbie Burns' famous poem "To a Mouse " come to mind when their pland ended in tatters but they did take the young Prince Imperial to St Augustines whenever they attended church there. St Augustines in 1890. A bronze equestrian statue of Joan of Arc now stands in the foreground, still defiant but now against sea of traffic. The road on the left is rue Malesherbes. 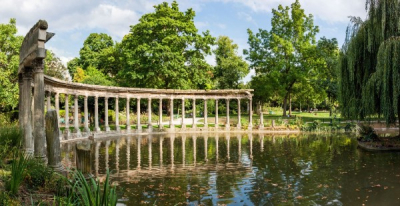 If you stroll up the slight incline of rue Malesherbes then at the top you will arrive at a magnificent set of gilded gates which are one entrance to the Parc Monceau. The northern gate, has at its entrance a domed neo- Doric toll gate built in 1785, beyond which the area was nothing more than a small hillock, with a tiny village, beyond which was a hunting ground for the King and his entourage. The Park Monceau had its origins in the purchase of the land in 1769 by Louis Philippe Duc d'Orléans (1747 –1793), on the occasion of his marriage to the Princesse de Penthièvre; this was the very same Duc d'Orléans who called himself Philippe Égalité, who lived in the Palais Royale and whose alliance with the Revolutionaries never prevented his going to the guillotine. However, all that was something undreamt of when he began work on turning the site into a pleasure gardens in 1878. The designer of the park was Louis Carrogis Carmontelle who had a fondness for placing follies around his gardens and when the gardens were completed in 1779 it contained an Egyptian pyramid, a Roman colonnade, classical statuary, a tatar tent, a farmhouse, a windmill, a Temple of Mars, a minaret, an Italian vineyard and a grotto - to complete the picture there were also servants dressed in oriental costumes and a variety of animals not usually found in parks, such as camels. The lily pond beside being decorative was utilised for mock naval battles - a miniaturised version of the displays in the Colosseum. It's difficult to sympathise with the Duc d'Orléans after he had voted for the death of the King and acted as if he was a man of the people, but for an aristocrat to believe he could befriend the Revolutionaries was akin to walking into a lion's den; there is some evidence that the Duc d'Orléans acted as he did to protect his children and it is certain that he was menaced by sans-culottes at every turn but the fact remains that in his role of Philippe Égalité he will always be branded as a regicide. The ultimate fate of the Duc d'Orléans was all too predictable and following his death by guillotine in 1793, Parc Monceau was confiscated and declared belonging to the state, along with all his other properties. The park was not returned to the Orléans family until the restoration of the monarchy in 1815. 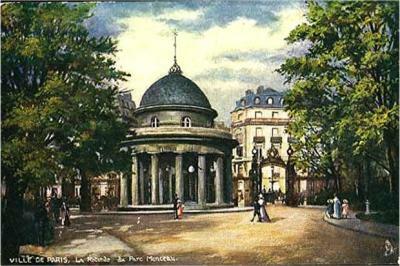 In 1860, the park was purchased by the city of Paris when it was redeveloped as part of Napoleon III's and Baron Haussman's plans for the Grand Boulevards, and sadly cut in half to accommodate the building of a number of grand mansions owned by the wealthiest families in the city - Pereire, Rothschild, Cernuschi, Ménier and Camondo were several owners whose own gardens opened onto the park and they all had access 24 hours per day with the paths widened to accommodate their carriages. 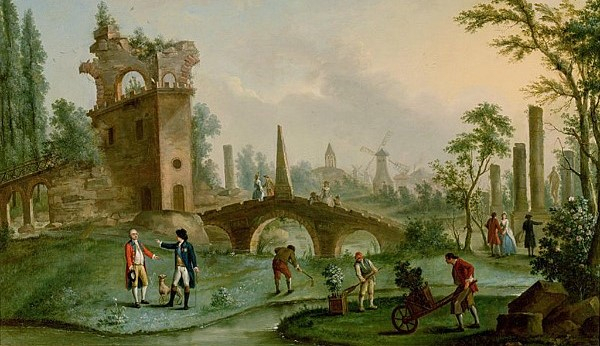 Given that the so-called public park was surrounded by grandiose mansions, which are still a feature today, were then and are now affordable to only the very wealthy it was hardly surprising that the artisans and working classes, whose houses had been demolished in order to create such opulence ,were resentful. It was therefore ironic that in 1871, Park Monceau was yet another site of a massacre when a number of the scattered Communards were cornered here and shot down - and it's quite strange how the Communards made their last stands in the most beautiful parts of the city. 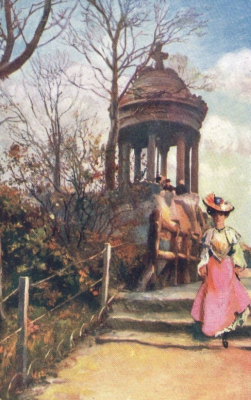 Today the park is half its original size and many of Carmontelle's beloved follies are gone but the park remains today one of the finest in the city where it is difficult to stroll along without sighing for just one sight of the original concept. The painting above is by Louis Carrogis Carmontelle himself. It depicts Carmontelle handing over the keys to the Parc Monceau to the Duc d'Orléans . In the background all the fantastic follies are on show but what is most interesting are the gardeners using traditional tools - the King might have supplied the money and Carmontelle the designs but without the gardeners and their hard work and knowledge the park would have never been made.